Turn the laptop off as soon as possible. 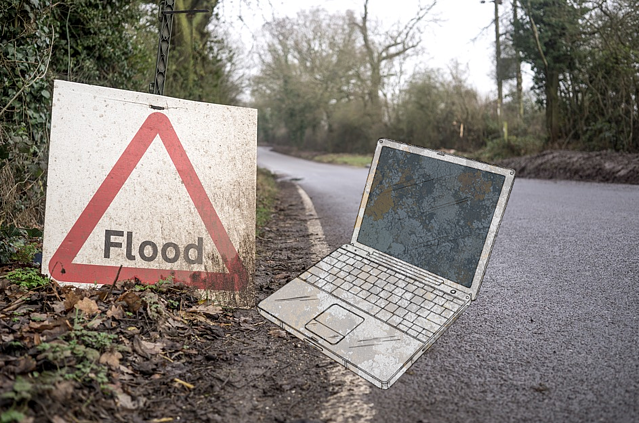 If your laptop is sitting in a puddle of liquid, you can pick it up quickly and gently and get it out of harms way first. But the next step is to turn that thing off. Hopefully you already saved whatever you were working on, cause every second counts, and you need to turn that machine off immediately. Press the power button down and hold it until the machine turns off, and unplug it. This can cause some issues, but computers are much better at recovering from an unexpected shutdown than they are from getting short circuited. Unplug the computer, too. If you can do it easily, this is also a good time to remove the battery. Once the machine is powered down, make sure you get all the liquid off of your computer that you can. Pat it with absorbent paper or cloth towels, whatever works. Be careful that you don't accidentally cause more water to drain into the computer. This may also be a good time to carefully open the computer and examine it for moisture, if you're feeling adventurous or know someone who can do it for you. It can be really tempting afterwards to try and turn your computer on and get back to what you were doing. Don't do this! If there's any liquid inside the computer, powering it back up could cause short circuits, which can easily burn out sensitive components and prevent your whole system from working, or even cause data loss. Even if it boots up and seems fine, you might end up causing more problems. Waiting at least 48 hours with the computer in a sealed container with unused silica gel packets is your best bet with this method. Repeat the mantra, "I can wait, just 48 (hours)" to help get you through the digital withdrawal. I think it's worth stressing a second time, PLEASE do not try to see if your laptop works until you can be fully sure that there is no liquid inside still! We see several laptops per month that have motherboard/logic board failures due to liquid spills, and replacing that can be very pricey. Like new laptop kind of pricey... in addition, your data will very possibly get corrupted or damaged if the computer starts to run and unexpectedly shuts down, or water works it's way to the drive's electronics. In a best case scenario, you'd wait at least 48 hours, examine the internal components for damage, then turn your laptop on, and it would work fine. If it doesn't turn on, or turns on and then shorts out, unplug it immediately. If it works except for keyboard issues, your keyboard may still be wet or it may have shorted out. Give it more time to dry! If you're 100% sure it's dry, grab a USB or wireless keyboard if you really need to. We're starting to sound like a broken record because we mention this in almost every single help article we write, but having a recent backup of at least your files will help ensure you don't lose anything intrinsically valuable to you. Make sure you keep regular backups. If you're not sure how to, check out our free Guide to Backing Up Your Computer. 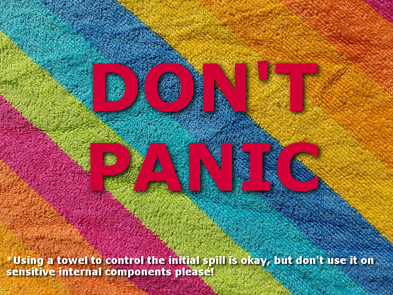 Not everyone has the skillset or the time to deal with a spill correctly. That's where we come in! If your laptop recently took a spill and you want us to take a look at it, feel free to bring it by. We can open it up, check for damage, and dry it out the right way. We can even pull your hard drive out and retrieve your important files so you can keep working when your laptop can't. We perform regular diagnostics for liquid spills, see our Pricing Information for current rates, but always give us a call or stop in if you're incredibly worried about your digital friend and we can give it a spot check and make a recommendation on whether it seems like we can revive it.